8.88 24 hour and almost hour clock, human talking. Signals each hour and almost hour differently. Spoken languages: US, British, AusE English, Hungarian, Czech, Cuckoo, Chime and Effects. Binary time telling also included. 8.88 24 hour clock human talking clock. Signals each hour differently. Spoken languages: US English, Chinese, Spanish male, Spanish female, Arabic, Cuckoo, Chime and Effects. Binary time telling also included. Talking Timers 2.45 Lots of human talking everyday timers. 18 separate alerts per each timer. Count to time and count down clocks. Talking Timers to Check 2.46 Full functionality but limited to two timers only. 'Lunchtime in 10 minutes', 'have a break in 5 minutes'. These apps run under the latest iOS versions! - Enable notifications for the app either when the app asks for it, or later going into Settings! These will be corrected in the next versions. There are no other known errors in the apps. Some users reported problems with setting up the spoken alerts. These are not real problems, but you have to understand the alert settings of the OS. 1. Do not disturb should be OFF. from the background during the do not disturb intervals! 2. Sounds/Ringer and Alerts volume control should be set so that you hear the sounds. 3. Notification Center/app name/Sounds should be ON. In some rare cases (e.g. sometimes after an upgrade) you need to delete the app and download it again to get back normal functions. for support and for all your asks, needs, problems and questions, for the pat on the back or for the curses. This time telling runs from the BACKGROUND!! Runs together with your beloved other apps. Also has hourly, half hourly (almost time) chimes and cuckoos and other sounds signaling the exact number of hours. Almost time also included, will tell you the time minutes before the hour. Almost time from 1 minute to 59 minutes before the hour. Binary talking clock also included, for all who like silent, nonintrusive effective time telling. The included binary clock might need a tiny IT background from you to understand. Clock speaks several dialects of English and also Czech and Hungarian. also has hourly chimes and hourly cuckoos signaling the number of hours. Especially great are the binary time telling setups. Discrete sound, no one else will know what these sounds are telling you. has a 12 hour or 24 hour face for all these clock faces. This app uses the best features of all the apps we have created so far and much more. Try out, check out the free version first! It is fully functional, but contains two timers only. Almost no power drain even with lots of running timers. count to time timers (e.g. run the timer every day till the 08:30 AM target time). As the target time of the timer comes near, the human talking alerts are fired one by one. Each timer can have as many as 18 separate and different human talking alert messages. Each telling the remaining number of minutes, just sounding a discrete beep or sounding some other provided sounds. at 07:50 the leave for work timer tells you: "leave for work in 10 minutes"
at 07:52 the leave for work timer tells you: "leave for work in 8 minutes"
at 08:00 the leave for work timer tells you: "leave for work at this moment"
at 09:55 the start of study time timer tells you: "start of study time in 5 minutes"
at 10:00 the start of study time timer tells you: "start of study time at this moment"
at 11:45 the lunchtime timer tells you: "lunchtime in 15 minutes"
at 12:00 the lunchtime timer tells you: "lunchtime at this moment"
at 13:30 the presentation starts timer tells you: "presentation starts in 30 minutes"
at 13:57 the presentation starts timer tells you: "presentation starts in 3 minutes"
at 14:57 the presentation ends timer sounds a short beep for you. at 15:00 the presentation ends timer gives you a different short beep. or the 24 hours military time format in device settings. The setup and usage of this Talking Timers app is totally simple. on the name of the timer. Check the remaining hours and minutes in the middle column. dark green is for the last hour. Touch the gray number area of a timer to get into timer setup mode. the black numbers are countdown timers. Each timer can be setup as a countdown or count to time timer. and select the spoken messages for the separate minutes before reaching the target time. Or change the clock face to have a different alphabet or style or color. Your setups are automatically remembered. Or just use the built in defaults without changing a thing. The app will announce the remaining times even from the BACKGROUND!! While you are using your other apps, or even when your iPhone is switched off (but not totally powered down). You do not need to look, do not need to touch. You just need to listen. Listen to the max 18 human separate announcements for each timer. during doing exercises, cycling, and still be receiving these sound alerts from the timers. In the morning be constantly aware of the remaining minutes you still have before you have to leave for school or for work. Always know when your study time, class, break, coffee time, tea time, lunch time, dinner time starts or ends. Don't miss the next presentation, don't forget going home in time from the pub:-). Know when your laundry is ready, when the shop closes, the meeting starts and when it ends, or when you have to leave, when the work day ends. Plan and prepare to have a break in time. When to have coffee break or lunch. Do not forget, based on your setup, you might receive several human talking messages from each of these timers. and see the countdown clock ticking away the remaining time. Be in command of your time. kcolC Clock TalkTime (Free) - This is just the beautiful basic analog clock. 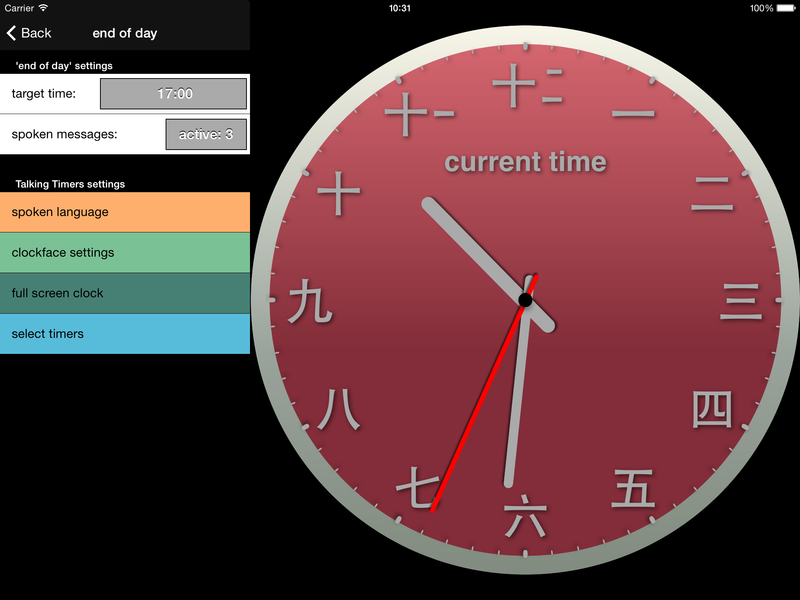 This was further improved and integrated into Talking Timers, Clock, Clock2, Chef Talking Timer, and other apps. some X minutes before the hour, e.g. by telling you: “it is almost 3 o’clock in the afternoon”. The X minutes before the hour is selectable from 29 minutes to 10 minute before the hour. Also good for a cc. half hour chime (set it to 30 minutes before the hour). Use it together with Clock 2 which is used for a full hour chime. Chef Talking Timer - Not just a talking tea timer, but also a full blown talking kitchen timer for lots of other food. e.g. telling you: “the tea says only 3 minutes left” or “the pasta says only 5 more minutes to go”. Up to 18 separate and different alert messages per timer. This time telling countdown runs even from the BACKGROUND!! Runs together with your beloved other apps. Try the free version first! 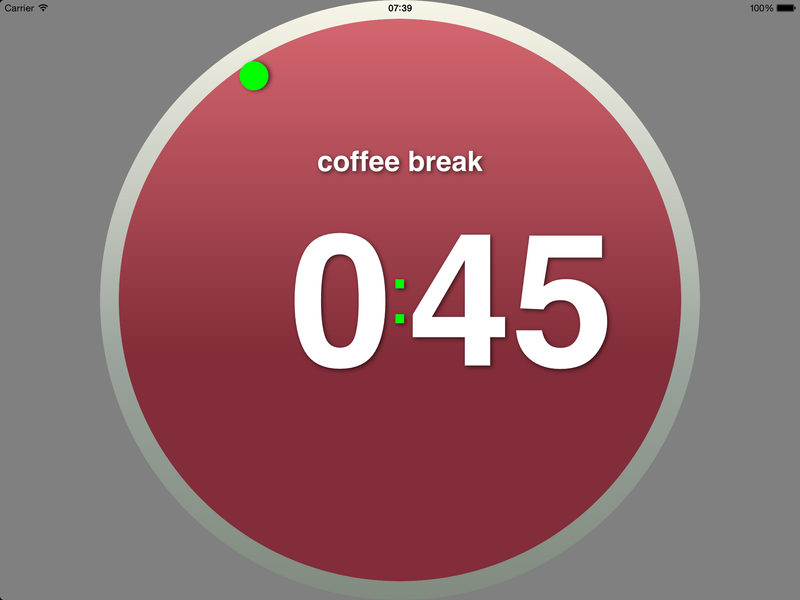 Talking Chef Timers to Check (Free) - Just a full blown talking tea timer and a full blown pasta timer in one app. 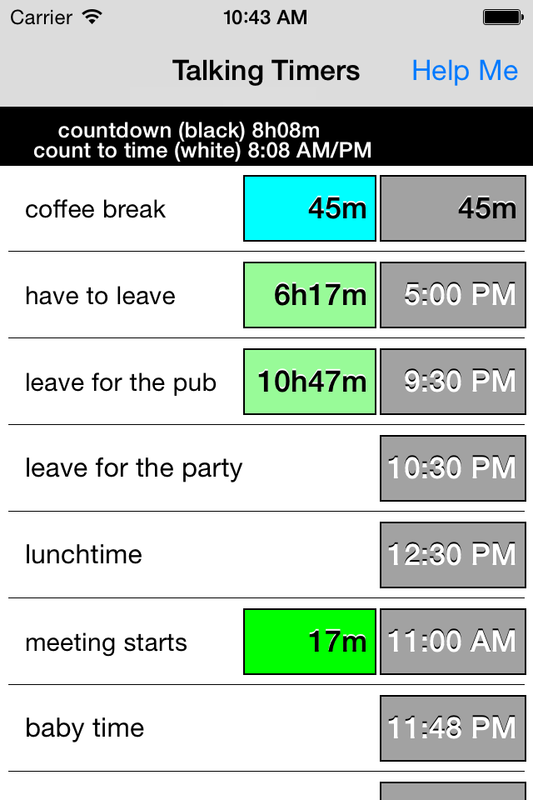 Talking Timers to Check (Free) - Just a full blown talking lunchtime timer and a full blown break timer in one app. e.g. telling you: “have a break in 30 minutes” or “lunchtime in 10 minutes”. Up to 18 separate and different alert messages per timer. from the TalkTime family at the bottom of this page.